Forums are very good places for discussing any topic. PTC forums are places where you can discuss about your Pay To Click problems. You can get answers to questions you may have or get help from other users for issues you might be dealing with your favorite ptc site. You can post comments or reply to other people’s comments and start discussions that would help you become more educated on the subject. Also, forums are good places to get some Direct Referrals if you know what you are doing. When I started with Clixsense 4 years ago, I’ve made some terrible mistakes that cost me a lot o valuable time. In this article I decided to write about 7 things I wish I knew from the beginning in regards to forum marketing. If you follow the tips below your forum marketing efforts will start to reward you. PTC forums are places where you can help and get helped by other members. When I first started promoting my affiliate link on forums I didn’t care about solving other members problems. I just wanted to get some referrals. I got banned from a couple of forums because I was just posting my referral link on different threads and I was literally begging for someone to join me on Clixsense. After a while I understood that by helping others on forums with good, helpful answers you are building a reputation around you and people start to trust you and like you. And when they do that, they are more willing to join you because they feel safe. They want to have a good sponsor that will help them succeed. So, to have success with forum marketing, then you must develop a helpful habit towards other users. An avatar could be a photo of you or the logo of your website. By adding an avatar on your profile you promote trust towards you and you get better results on your promotion efforts. When I first started on forums, I never uploaded an avatar. Maybe I was shy or maybe I never took the whole forum marketing thing serious. After I realised that people trust you better when they know who you are then I uploaded an avatar to all the forums I had a profile on. Combined with the helpful answers I was giving, I literally became a PTC Rock star. Nor you should publish your Clixsense banner. Why should anyone click on the link on your signature? Because you say them to? On the above example you will link your signature to a blog post that talks about how rented referrals are not going to help you earn money and you will offer an alternative. Clixsense. Do you understand the difference now? By the way here is a list with Free Blogging platforms to create a free blog. The more active you are in the community the more trust you will create around your name, people are going to like you, and your signature will be available to more and more threads for people to click on. As simple as that. Always try to login to your forums at least for half an hour and answer as many question as you can or take part in conversations. When I first joined these forums I was just going through the different topics reading them but not posting anything. I guess I was bored. Being lazy is bad for business though. Don’t Spam your Clixsense affiliate link. You look desperate and unprofessional. People don’t want to have anything to do with these kind of people. Instead, use the methods I discussed above to build your brand and have people want to join you. Forums have advertising spaces. 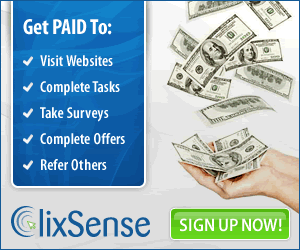 I strongly recommend to advertise your Clixsense affiliate link there. You will get very good results and faster. Promoting your affiliate link with the methods mentioned above, they will get you results but not so fast. It is also much harder to get direct referrals using free methods. Buying an advertising space though, you will get direct referrals without spending time. You spend some money instead. Getting direct referrals from forums is not something that can be done in one night. You must be patient with your results. You must be patient and continue promoting your affiliate link by advertising and by utilising the points above. I remember that I was about to give up with the forum marketing thing because I thought that it was not working and not because I was doing mistakes. after I fixed my mistakes, things got a lot btter. I just had to be patient with my efforts. I hope you enjoyed reading this article. If you want to help me, then spread this message around the web. The more people see this, the more people they will stop making any of these mistakes.